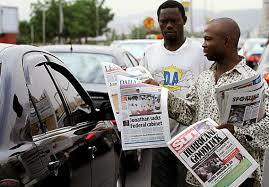 Following the storming of newspaper's stand at St. Michael's road in Aba on Tuesday morning by members of the Nigerian soldiers from 144 Battalion Ohafia Brigade, seizing loads of newspapers believed to have reported news or stories bordering on Biafra, it can no longer be denied that the Federal Government of Nigeria is on a pervasive and perilous course in gagging the press, the state of public opinion, the rights of readers to seek for information and the liberty of vendors to circulate them. The public must have been disappointed by this retrogressive and violent act of the Nigerian soldiers which has no authority to dictate how media institutions should operate since it is not part of the Nigerian government. It is a pity that instead of been an all-inclusive society, regardless of how different the line of thoughts published on newspapers may be, Nigeria has turned to a Mafia state where the violent takes the reins of power. They have extended their intimidation to the media which every citizen is free to utilize for the expression of their views. Why would the Federal government give authority to its cadres to attack newspaper vendors, readers and publishers when they should be protecting innocent citizens? The rights to freedom of expression and access to information in addition to the media's ability to operate independently are vital in any society especially a democratic one as they protect other human rights, such as the right to demonstration and self-determination while they prevent imperious or dictatorial rule and underdevelopment which are common in Nigeria. However, it seems that the federal government under President Muhammadu Buhari, is trying to curtail these rights in order to stop dissenting views or ability of others to share their ideas and opinions via the media as provided by the Nigerian Constitution which is the supreme law of the land. To try to penalize the media or vendors for publishing or carrying/selling news or stories in respect to Biafra or other similar issues, is in itself inconsistent and contravenes with the Constitution of Nigeria which has no clause on it guaging and gagging the media. Therefore, one wonders why there is this big danger to the rights of citizens, publishers and vendors to express themselves freely, to access vital and truthful information and to media independence when the country is suppose to be a living democracy. It is absolutely necessary to educate the Nigerian military cadres about the democracy that allowed for everybody to exist freely regardless of their divergent views and opinions on issues or any newspaper publication and not blows or any form of terror on the citizens. The federal government of Nigeria's current administration on its part, needs to be inculcated that democracy is a governance system in which ideas are the only commodity that is traded through freedom of expression which can be achieved via appearance on radio, television, newspapers and magazines or through meetings and other social platforms/means. Storming newspaper's stands to confiscate newspapers from vendors in the guise of going against hate and inciting reports, does not only cause an impediment to the free flow of information but also a monetary loss to the vendors who makes a living out of it considering the current economic catastrophe and imbalance. Written By Ucheagu Chukwuemeka C.